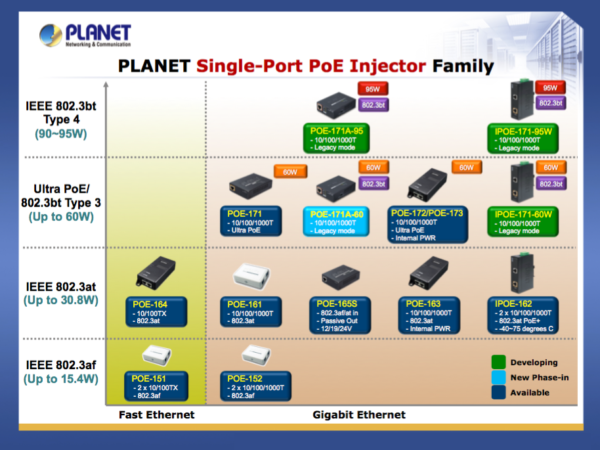 The POE-173 from Planet Technology is a 60-watt Ultra Power Over Ethernet Injector that is stable and effective. 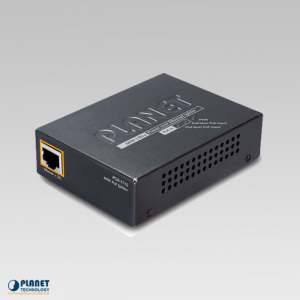 The POE-173 from Planet Technology showcases 60-watts of power and provides dependable connection for networks. This unit is a 60-watt Ultra Power Over Ethernet Injector that is stable and effective. 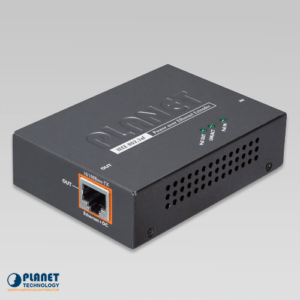 The POE-173 has the ability to send Ethernet digital data with DC 50V power over the twisted pair cables. 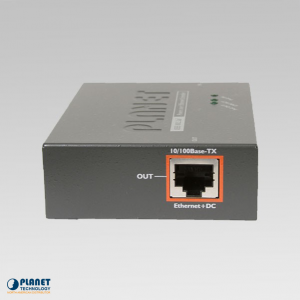 This unit operates as a Power Over Ethernet Injector that provides 60 watts of power. The unit utilizes IEEE 802.3at / af PoE cabling standards and offers the ability to source as much as 60 watts of power using all Ethernet cabling pairs. The system allows for two PSE controllers to be utilized to power the data and spare pairs. PoE Standard IEEE 802.3af (802.3at Type 1) IEEE 802.3at (802.3at Type 2) Ultra PoE (POE-173) Maximum Power delivered by PSE 15.4 watts 30 watts 60 watts Power Available at PD 12.95 watts 25.5 watts 50 watts Voltage Range 48V 50~57V 50V Twisted Pair Used 2-Pair 4-Pair Supported Modes End-Span or Mid-Span End-Span + Mid-Span Supported Cabling Cat 3/5/5e/6 Cat5e/6 It not only reduces costs, but features plug and play technology, simple installation and troubleshooting features. 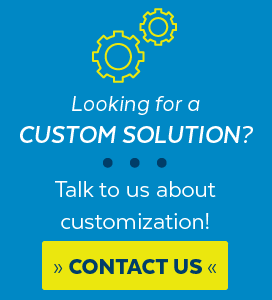 The unit is ideal as a device that provides comprehensive solutions that make sense. The unit offers a 100-240V AC input socket on the front of the device, two LED lights and two RJ-45 ports. Users have the ability to simply plug in Ethernet cables in order to have high power communication. The device allows users to transmit power and data at the same time through a single Ethernet cable for up to 100 meters. The unit allows for even more efficient wireless deployment and removes restrictions caused by dedicated power outlets. 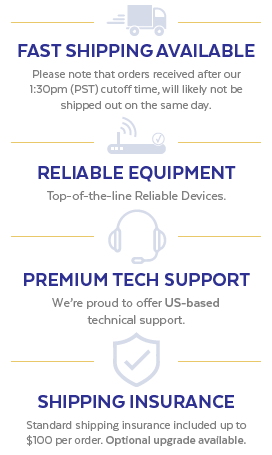 The POE-173 is backwards compatible with both 802.3af and 802.3at PoE standards, and gives users the ability to deploy units even more effectively. The unit makes installation and management even simpler than ever. Power Requirements 100-240V AC @50/60Hz, 1.5A max. Power Consumption 60 watts max. 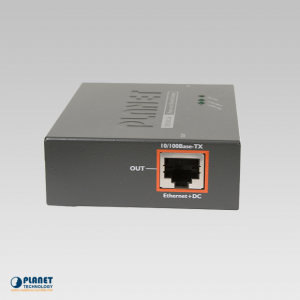 The POE-171S from Planet Technology is a state-of-the-art Gigabit Power over Ethernet splitter that sends digital Ethernet data utilizing DC 56V power. The POE-E101 is an ideal choice to extends Power over Ethernet capabilities beyond its standard 100 meters.